We have a whole bunch of incredibly good questions this week, but before we get into them- It’s Black Friday! We have SO MANY amazing sales happening right now. Here they are! What a great question! Absolutely! I do it all the time. It goes back to when I was working with Dave Jerden, I believe it was in 1998, he did Americana by the Offspring, which was an absolutely massive album. The song Pretty Fly (For A White Guy) was a really really massive hit. For the guitar sound- the amps he was using were a combination of all kinds of things! He used classic amps like marshals, some VOX’s, and he had a massive collection of incredible amps PLUS he started using Amp Farm. 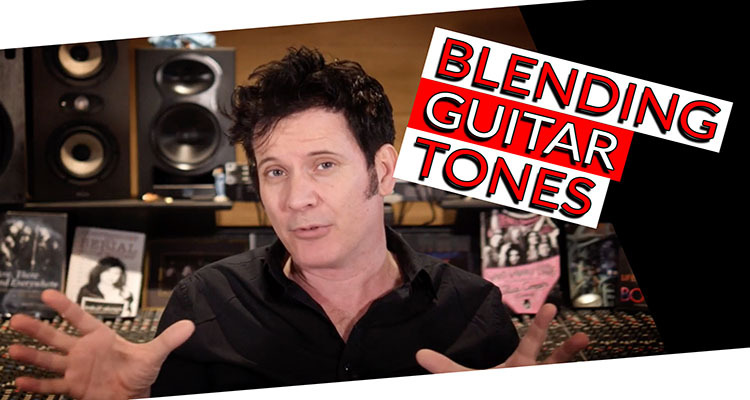 He was blending Amp Farm guitar sounds with real guitar sounds and getting massive sounds. So back in ’98, twenty years ago, that was already happening. The blending of artificial emulations with the real thing and created an absolutely massive, amazing guitar sound. It’s been going on for ages and I highly highly recommend you try it for yourself. I’ve done things in other videos where I’ve taken a real sound and the DI, and treated the DI differently. One thing that’s nice about taking a super clean DI is that you can smother it with verb or a delay and create something around an amp sound which is so unique- because the reverb has a different kind of presence than the fuzzy distorted guitar sounds. This is a wonderful time we live in! We can do all of these fun things while we’re also mixing in impulse responses from cabs, with emulations of different amplifiers, with real tones as well and just have some fun. Remember, try messing around a little bit. If you’re going to use two or three different sources, run delays on them so they create a different kind of width! If they are delayed slightly, they are going to get out of the way of each other and there is less likelihood for there to be phase cancellation. If I’m going to take two or three sources and create this massive guitar sound, I might really enjoy putting different delays and reverbs on one or two of the sources so that there gets to be some space around it. Mess around with it, try all kinds of things – I highly recommend it. If you’re an academy member, a lot of the time the multitracks I give you in the academy have DI’s printed! The multitracks that I gave you last week on YouTube of the Workday Release song “Stay” has DI’s in it as well! You can put amp simulations and emulations on that song as well and play with impulse responses! • Does it make sense to use a Desser to control tracks that lead to conflicts in the mix, I mean instead of EQ? • Is it better for mixing to convert the midi clips to audio clips? • How do you mix the C12A in your piano track? Dead Center, with the 2 U47’s L/R(Left/Right)? • Are you mixing in your headphones through the computer’s headphone jack or through the interface? • Have you ever tried blending real amps with these? •How do you prefer dealing with a drum kit with 2 kick drums? Do you prefer just using one mic on a double pedal or using both kicks?